British director Steve McQueen’s last film was the Best Picture winner art film “12 Years a Slave.” It was a power film about survival. Five years later he brings us another film about survival albeit much more “commercial” but it still cares an important message this time about race and gender. 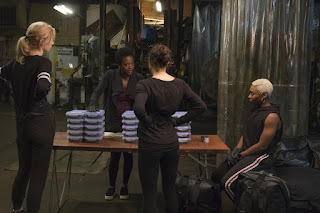 Based on the 1980s British miniseries, “Widows” is a fantastic heist drama with equal parts social commentary and entertainment value. Its outstanding and diverse cast is captivating to watch, McQueen’s direction is stylish, and the twisty script is deliberately enthralling. This is perfect mid-budget studio entertainment that is too much a rare breed these days. When isn’t Viola Davis just plain captivating to watch? Every. Single. Time. Here she’s Veronica the wife of Harry (Liam Neeson) who has recently died in a botched robbery along with his other partners. His death hasn’t only left a void in Veronica’s life, but a rather large debt owed to local crime boss/politician Jamal (Brian Tyree Henry). Jamal is running for a local alderman position against Jack Mulligan (Colin Farrell) who has a strong family history in politics. When Jamal and his brother/henchman Jatemme (Daniel Kaluuya threatens Veronica she devises a plan to pull a job herself made from plans from the notebook her husband left behind. She recruits the widows of the other men killed in Harry’s botched job including Linda (Michelle Rodriguez) and Alice (Elizabeth Debicki) who are also strapped for cash. It’s sort of “Ocean’s Eight” filtered through the lens of Martin Scorsese and Spike Lee. Working from a script written by McQueen and “Gone Girl” scribe Gillian Flynn, McQueen has crafted a gut punch of a film. It balances its characters and plot elements remarkably well. The film takes its time establishing these characters who have found themselves in a desperate, unfortunate situation. Veronica is a complex woman and as we learn more about her and her husband and a tragedy from their past that is a commentary about race relations in our current world it all feels almost too real. 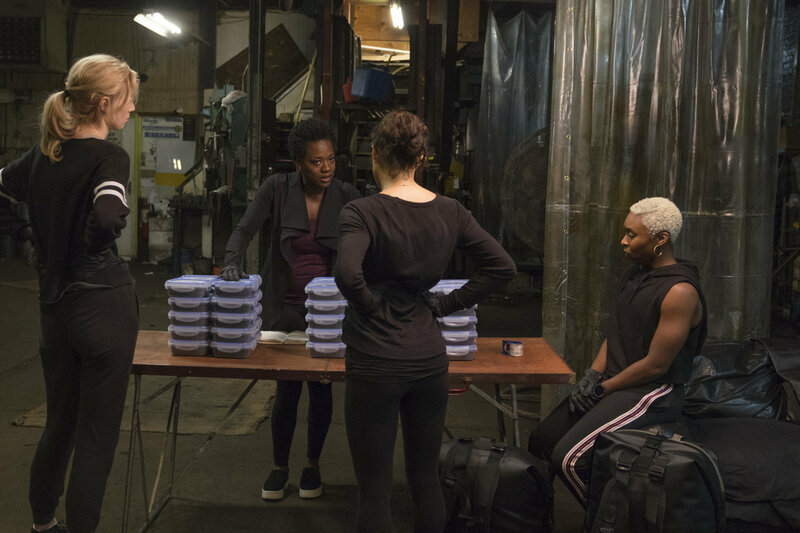 But the film is allowed to breath as the film focuses on a not too complicated heist (after all these women are inexperienced civilians). Moments of earned humor thankfully lighten things up here and there while suspense dominates the film’s final act with Hans Zimmer’s Dark Knight-like score being the driving heartbeat. Visually speaking the film has plenty of outstanding camerawork and long takes from McQueen’s go-to DP Sean Bobbitt.